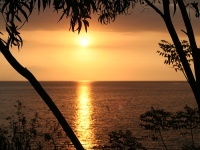 Lombok attracts those searching for 'undiscovered' Indonesia and was for many years a haven for backpackers. The attractions on Lombok are its pristine beaches, paradise islands and secret surf spots, although the area is rapidly losing its off-the-beaten-track credentials as more tourists discover its considerable wonders. Resorts are now springing up to provide a more commercial and luxurious Lombok experience, but it still retains its secluded beauty and unscathed coast. 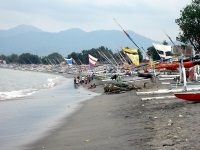 Visitors tend to begin their Lombok travels in the metropolis formed by the combination of the four villages of Ampenan, Mataram, Caimanegara and Swete, on the west coast. Ampenan is the most foreigner-friendly and is on the coast so it tends to be the springboard for the rest of the island. From here travellers head north to the beautiful volcanic scenery and hiking trails of the Gunung Rinjani National Park, which includes Indonesia's third highest peak, the spectacular Mount Rinjani volcano. Or set out for the stunning Gili Islands, which until recently were a backpackers dream, almost totally deserted and pristine. The islands are slowly becoming more developed but they are still charming destinations. Just a few miles south of Ampenan is Senggigi, Lombok's most developed holiday resort and arguably the only place on Lombok with a decent nightlife. Visitors also flock to the southern beaches around Kuta Lombok, loved for their white expanses of sand and great surf breaks.